Theophilus Phillip was born March 23, 1926 in Princes Town, Trinidad, which was then under British colonial rule. He’s said to have been a clever boy and was early on attracted to the humor and creative wit of the calypsonians – the eloquent bards of the island. His father, a railway worker, wasn’t keen on the idea of his son pursuing a career in this field, it not being considered a very respectable one. The saga boys of calypso fame were known to be promiscuous party animals, flashy and boastful. Still, to earn one’s livelihood by singing calypso was difficult even for the top-ranking figures of the art form. Conditions changed in the forties, however. Thanks to the deployment of American troops during the war years, the island experienced an extraordinary influx of yankee dollars. By the end of the war, the entertainment business was in a better swing than ever. Repetition of the first lines of the first verse was a well-established custom in calypso that has held sway to this day. A plausible theory holds that this was a strategy developed in order not to let the opening words get lost to a more or less unruly live audience. The venue in St. Ann’s might possibly be the posh Hotel Normandie, which used to cater to an American crowd. That evening, the stage was apparently populated by “white people”, by which Spoiler meant “not of Creole descent,” like most of the prominent Trinidadian singers. 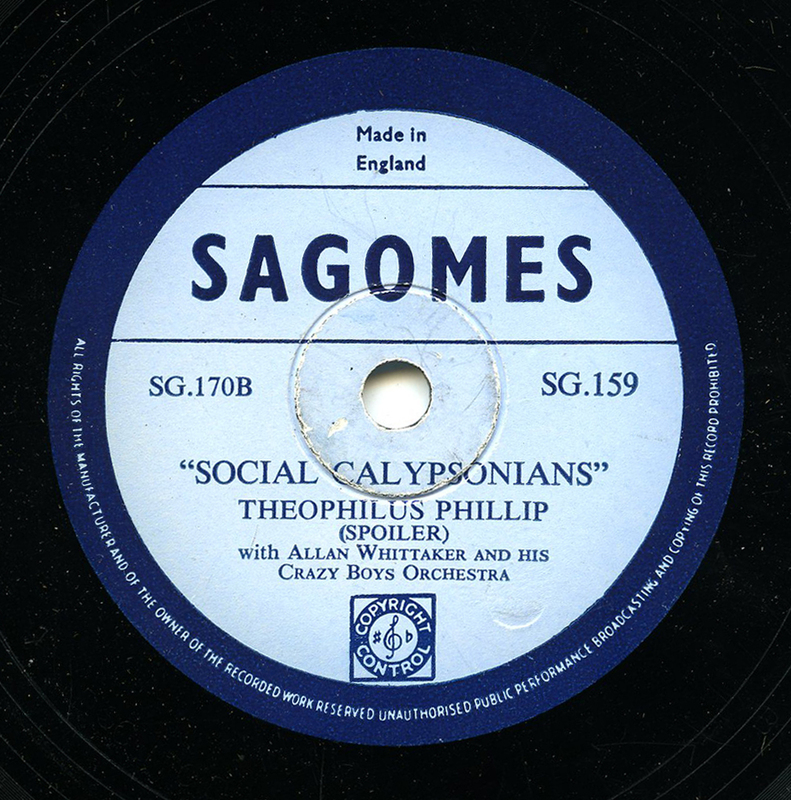 The term “social calypsonians” might be a way for Spoiler to say he didn’t consider them to be true calypsonians – who were supposed to write and sing their own material – but rather entertainers, calypso singers, who sang already well-known calypsos to please the crowd. A zandoli, for those who haven’t seen one, is a Caribbean lizard. There have been at least two calypsonians (or “chantwells,” as they were called initially) to use this moniker. One sang in the 1870s and the other, Sylvester Anthony, almost a century later. The Mighty Zandoli of Spoiler’s song might well have been a purely fictional character. Of the other singers name-dropped, the only one I have found a reference to is Lord Trafalgar, but he seems mostly to have been active in the twenties and thirties. “Canaan Barrow” was another hit calypso, sung by King Radio in1948 (some sources cite Lord Melody as the composer). Its popularity gained it the status of “road march,” meaning its refrain was played and chanted in the carnival processions that year. Lord Elephant has changed his mind, however. He now wants to sing the 1946 road march “Jump in the Line,” often attributed to Lord Kitchener. Its refrain and variants of it have been used in so many versions around the Caribbean (and on Belafonte’s massive hit album Jump Up Calypso for that matter) that it almost seems to have been born right into – or out of – the public domain. The words following the title usually go, “shake [or rock/wag] your body in time.” But Elephant, or perhaps the police or the patrons of the venue, deems that line too unsophisticated for the respectable crowd. So Elephant employs his poetical skills and comes up with… a stylish alternative. Again, Spoiler falls to the ground in heaps of laughter. And on it goes. One after the other, the calypso copycats fail miserably with their ridiculous accents and vain attempts to sing “decent” enough to keep potential censors at peace. Spoiler sure did have a ball that night. As within the world of pop and rock stardom, alcohol was an ingrained element in the calypso community. Social drinking in the calypso and carnival season easily turned social calypsonians into solitary rumshop frequenters off-season, and Spoiler was by all accounts one of them. Mighty Sparrow (by now the king of all calypso kings) said of Spoiler that he was “one of the greatest calypsonians ever and I have never seen him sober a day in my life.” Throughout the fifties, Spoiler went on to produce some of the most imaginative calypsos ever written: tales about cat brain transplants and twin brothers, sleepwalkers and stalking shadows, female police officers and magistrates trying themselves, cases of canny backwards talking and extremely bad spelling. But years of intensive drinking finally took its toll on the bard. Spoiler died at 34 years old, on Christmas Eve 1960. He was buried at the Woodbrook Cemetary in St. James. This has to be one of the best blogs I’ve come across in a long time. There’s nothing like reading good long-form essays (or even deep short-form ones) on great music that has largely been forgotten. I’m actually a student of Mark Lewis’, who recommended your blog highly. I can see why! When you have very cool instructors into great music, the chances are that he’ll be turning you on to some things you may have missed out on as you are doing in return. Brilliant reading here.